Create a Holiday to Remember! 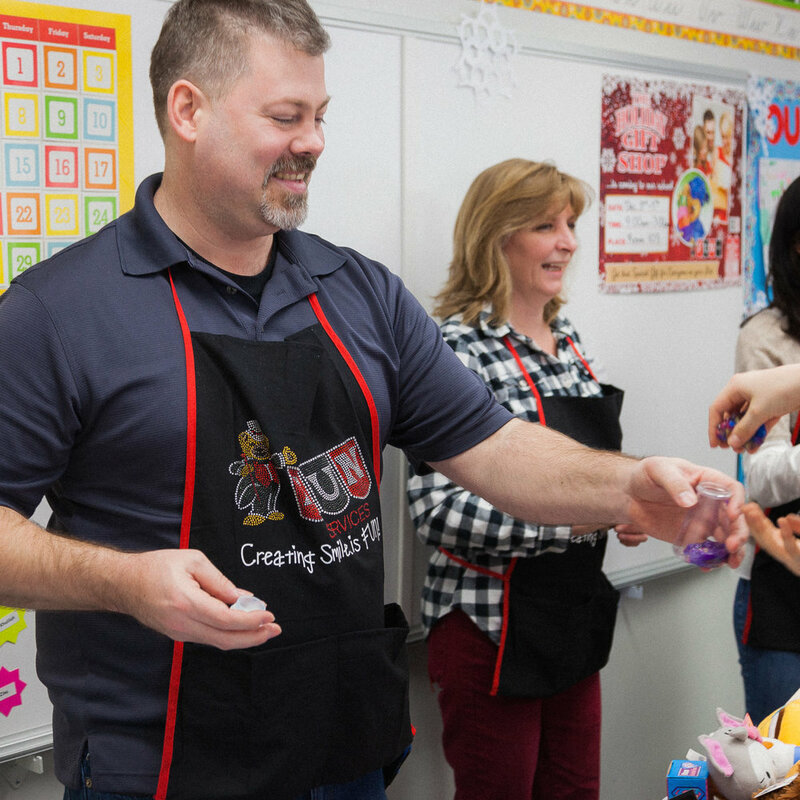 This upcoming school year, discover the magic of holding your very own Holiday Gift Shop! The Holiday Gift Shop is a complete in-school holiday shopping program for kids, that is easy for you, and fun for your students! At the shop, your children will have the opportunity to buy quality kid-priced gifts for family and friends, all in the safe environment of their own school. They will learn the importance of saving their money, and will be able to plan their purchases in a positive learning environment. With your shop, you will receive a gift line of over 100 unique gift items (with all-new items every year), plus free marketing materials, gift wrapping, direct phone support, and much more. You get to determine your own selling prices and profit margins, and you only pay for the gifts you sell, once your shop is over! Any unsold gifts are returned to us for free. The Holiday Gift Shop gives children a first hand experience of the joy of giving. So don't be surprised when even your youngest students show more interest in giving their gifts than receiving their own! Apply before May 15th and receive $100 in free merchandise! Apply Online or call us at 1-800-665-5656. We work with your school to determine the right amount of gifts to order, based on the number of students you have. Every year we have a completely new gift line, so there's always an abundance of choices for your students to pick from. We have a wide selection of gifts (over 100 all-new gifts each year!) tailored to appeal to every member of the family. Many of our gifts are personalized for specific relatives, make it easy for your students to find the perfect gift for their loved ones. We provide you with everything you need for a successful shop free of cost, including detailed instructions, promotional materials, gift wrapping, shopping bags, tablecloths, gift-planner envelopes, and much more. There is no upfront cost — you pay only for the gifts you've sold, after your gift shop has been completed. We pay the shipping to and from your school, and everything aside from the gifts comes free with your shop! Making your upcoming holiday Gift Shop a success is our top priority. Along with our promotional guide, step by step program guide and direct phone support, we now have a set of easy to follow tutorial "How to videos" to guide you through your holiday gift shop experience! Your shop will include a gift selection of over 100 unique gift items, including toys, plush, fashion jewelry, keepsakes and much more! This was our first experience with a Holiday Gift Shop through Fun Services and we couldn't be more impressed with the customer service and products that we received. Our Santa Shop is a BIG event at our school and with switching over to Fun Services for our gift inventory we sold out three times over! I was personally very impressed with the quality and variety in the products for retail. We will definitely be re-ordering come next Fall! Join with schools across Canada who have made the Holiday Gift Shop a yearly tradition for over 35 years. Apply now for your next Holiday Gift Shop! Are you a returning school or have questions about the program? Send us a message or call us during regular business hours at 1-800-665-5656. For schools who are new to the Holiday Gift Shop, please complete the form below. Yes, we've used The Holiday Gift Shop before! How did you hear about The Holiday Gift Shop? Answering this question helps us to understand how people are finding us. Request a FREE sample box? Your application has been received! We will be contacting you soon to discuss bringing the Holiday Gift Shop to your school. What is the Holiday Gift Shop?